The Spirit Diary: It really is a learning journey, isn't it? It really is a learning journey, isn't it? It was our son's birthday yesterday. My little not-a-baby-anymore boy turned two. I can hardly believe that it was two years ago that we welcomed him into our family. I also can't believe that I'm still carrying all the cough-cough baby weight two years on! So in celebration of his birthday we had to have cake, right? 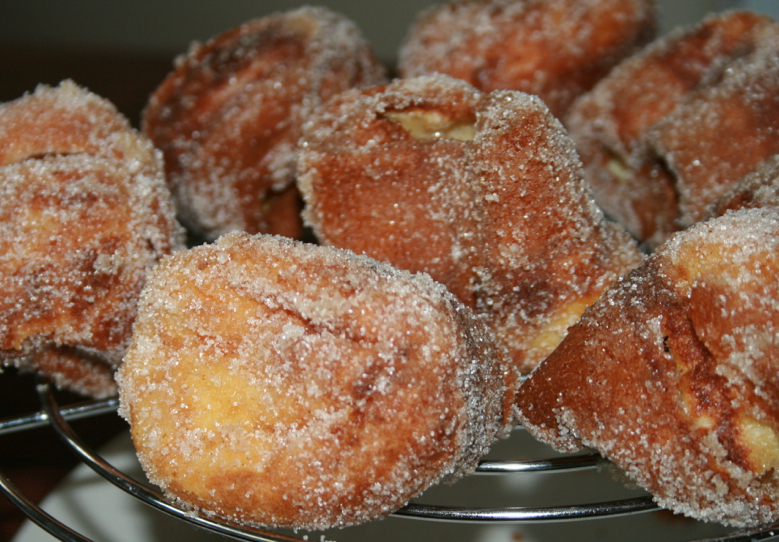 Well I didn't make a cake but I did make something just a sugary and filled with fat - I made cinnamon sugar popovers. Now if you are an Aussie, like me, you are probably thinking what on earth is that. If you are familiar with popovers, than you probably can't believe I made those as a birthday cake. So here's a picture of these delicious not-so-little treats! They really are a very occasional or rare treat because they are made with lots of butter and sugar. Here's the recipe if you want to try them out for yourself. I found a blog yesterday and I can't remember what it was called but it was about a lady that fell pregnant and gained a huge amount of weight. For two years she had been working out and working on being healthy, yet she had lost only a fraction of the weight that she wanted to lose. The point that she was making was that she had to celebrate the little successes and to just keep on going. That hit a chord for me. I (and you too probably) am constantly beating myself up for all of my imperfections. I am measuring myself against an impossible standard. Impossible to ever reach the lofty heights of what is 'perfection' in my mind. Constantly comparing myself, not only to other people around me, but to this unrealistic, invisible perfect me. This doesn't just limit itself to physical attributes like my weight and my hair but also to the intangible - my relationship with my family, my friendships, my work. Even this little blog - I'm constantly comparing it to other blogs and realising that it comes up short. The problem with doing this is that it makes me want to give up. If I can never reach this vision, this 'goal', then what is the point of continuing. I realise that this is totally messed up. But this is what I fight against every single day. I don't know how to stop the self-loathing and practice self-love. Hi there, thanks for stopping by. I hope that you find something useful or inspirational here. I started eating a whole plant diet in January this year and I lost 12kg (26lb) in three months. I'm learning something new every single day and would love to hear about your journey. You can contact me using contact form below or leave a comment in one of my posts.